There was a storm that rolled in the day before covering the area with a skim of snow and/or ice depending on your location. Friday I was down in Blacksburg, VA working and had a long haul home that evening. 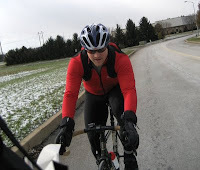 I didn't encounter any black ice until getting off RT 283 in Lancaster...Saturday would be interesting conditions for the second annual Cranksgiving York, benefiting the York Food Bank. I met Josh at his house and immediately threw on a 39t chainring on the Pista. It was definitly a platform pedal day too. We walked our bikes to the edge of the road of his housing complex, sliding downhill in some spots. 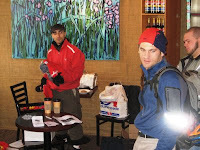 A 20min ride to the starting spot of the event got the blood flowing and some body heat generating. Again, there is no such thing as bad weather, just bad gear. I can honestly say riding platforms was a good call, not just for the ice on the roads but also warmth. Even with winter booties over my road shoes, my feet are good for about 90 minutes at sub 25 deg F. I wore my Etnies and their EVA padding inside provided a good amount of warmth. Sort of like comparing ski boots to snowboard boots; plastic vs leather and padding. 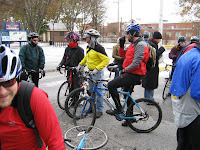 On a frigid morning (22 deg F), 32 riders assembled in central York, Pa to ride around to designated grocery stores, gather needed items on the manifest, collect the receipts as proof of purchase (poker run style)and hurry back to the finish. Top 3 men/women finishers received prizes. Costumes were optional as well as a preference of transportation. 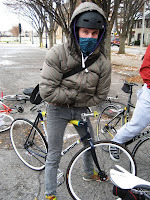 MTBs, road bikes, cx bikes, fixies and one SRM equipped race bike...gotta keep your watts up on a cold day like this! I gave Brian a call last week and egged him on to come out and ride. Brian worked last year for me at the bike shop I ran. Above--what ever it takes to keep warm. The local camera crew was there and a reporter from the YDR. 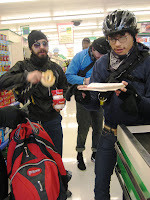 32 of us lined up and on Tone's shout, sped off to go grab the goods. Last year's opening ride was hallmarked by Josh taking a dirt nap while trying to bunny hop the train tracks on this fixie. Well, I got what I deserved from heckling on last year's post about that. Like a giant redwood falling in the forest, my front wheel washed out on a frozen train track, the second rail after I already negotiated the first rail. Thud and roll in slow mo. Guys from Lancaster and Philly. 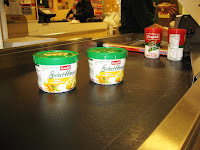 Checking the list -- this year the Food Bank of York, Pa has requests for goods. At least I didn't have to carry around 2 full bags of potatoes. Riding mate Hank Buckingham. I haven't seen Hank since the beginning of the summer. The ride was well spent catching up on miles and stories. Another riding mate, Josh Clingan. Me, Josh and Hank were all riding fixed gears. With the Hank's finance riding a geared road bike. 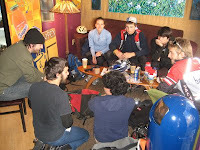 The ride finished at Sparky and Clark's Coffee Shop. 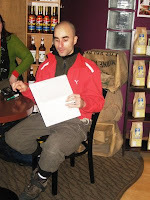 Tone, the man and brains behind Cranksgiving York. 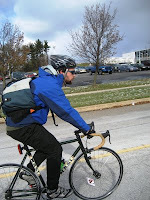 His experience from 10 years of NYC messengering and 8 years of organizing Cranksgivings in the Big Apple has allowed the city of York to get on the map with this worthy event. This year's winner - Matt Keller. He notched a second place last year. Last year's winner Lincoln, traded places with Matt this year. 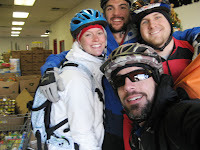 At the food bank dropping off our goods to help those less fortunate during the Thanksgiving season; l-r Kelsey, Hank, me, and Josh. We took a social pace to complete the event; coming in around 1 hr 51min. I can't wait for next year's ride!